Although there are numerous ways to structure a commercial income-producing property, the following model describes a typical 2 Class syndicate with equity Investors and a separate management entity. In the above scenario, you will form a separate, title holding entity that is also the borrower on any bank loan and sells interests to Investors (the Investor Entity). If you use a limited liability company (LLC) as the Investor Entity, it will be “manager-managed” with a “Manager” and “Members” as the passive Investors. Alternatively, you could use a Limited Partnership with a general partner (GP) as the management class and limited partners (LPs) as the passive Investor class. For purposes of this article we will use terminology consistent with an LLC (Manager and Members), as this is the structure most syndicators currently use. The Investor Entity will need an agreement between management and Investors (the Company Agreement) that will govern how the company will operate. The Company Agreement will define management and Investor rights and duties and how cash will be distributed to each of the participants. For the Manager, you would typically use a separate LLC (Manager LLC) that includes the management team as its members. If an individual is named as the Manager, the company can be harmed if something happens to that person, as it will no longer have a Manager until the Members can elect a replacement. If the Manager is a multi-member LLC, the Manager LLC will continue to exist as long as it has members and the Investor entity will be unaffected if something happens to one of them. 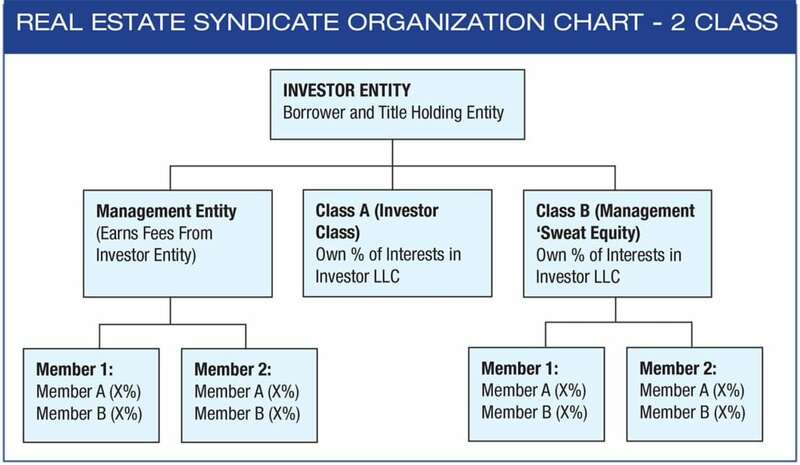 The Investor Entity in a syndicate will typically have multiple classes of Members. We’ll call them Class A (for cash-paying Investors) and Class B (the management or “sweat-equity” class). If certain Class A Members will have different returns, Class A can be broken into separate sub-classes (A-1, A-2, etc.). Investors will purchase Class A interests in the Investor Entity and become Class A Members. Class A Members will contribute 100% of the capital contributions necessary to capitalize the Investor Entity in exchange for a portion (e.g., 50%-80%) of its ownership interests. The Manager LLC (or its members) will retain the rest of the interests as compensation for their past contributions to the Investor Entity. Both Class A and Class B Members will receive “distributions” based on their ownership interests. Class A may be offered a preferred return (meaning they get paid their returns before Class B gets paid any distributions). Preferred returns can be cumulative (accrues even if no cash is available to pay it until some future event) or noncumulative (not as common). Preferred returns are typically calculated on an annualized basis but determined quarterly. If the preferred return is “cumulative,” arrearages (if any) would be made up at the next distribution event prior to paying current returns. Or arrearages could be deferred until a “capital transaction,” such as refinance or sale of the property (depending what your Company Agreement says). In this case, arrearages are paid after refunding Class A’s capital contributions, but before paying distributions to Class B or splitting equity between Class A and Class B. All of this is spelled out in a “waterfall” in the company agreement. If the return is “noncumulative,” Class A members get all of the distributable cash needed to make up their preferred return for the current distribution period, but deficiencies do not accrue. Class B is the service class. This class typically includes members of the Manager and/or others who provide services to the company, as determined by the Manager. Class B Members keep the remaining ownership interests in the company in exchange for a nominal amount (usually $100 or $1,000 total) plus their “noncapital contributions” to the Investor Entity. By paying for their interests, Class B can establish a cost basis for their investment so that when they do receive distributions, they may be taxable at capital gains rates versus ordinary income rates that would include self-employment tax. Class B Members only receive their portion of the distributable cash during operations after Class A Members have received their annualized Preferred Returns. On a capital transaction, Class B only receives distributions after both Class A’s capital contributions are refunded and any arrearages in Class A Preferred Returns have been paid. Consequently, Class B returns are subordinate to Class A. This is important for tax purposes, because if Class A and Class B are “on par” (meaning that they are only splitting profits, with no preference to Class A), Class B could incur a first-year taxable event for its portion of the ownership interests. Why Use the 2 Class Structure? To preserve distributions for the management class if the Manager is removed. To segregate fees from distributions so that earnings on Class B distributions may be taxable at capital gains rates, versus Manager’s fees, which will be taxed at ordinary income rates (with self-employment tax on those earnings). Since Class B retains a percentage of the interests, the Manager can allocate those interests as it sees fit amongst persons who provide services to the Investor Entity. This could be useful for people who find deals, participate in money raising, and guarantee loans on behalf of the Investor entity. For more information, you can read the articles: “2 Ways to Split Money with Investors” and “12 Ways You Can Earn Money as a Real Estate Syndicator” posted on the Articles page of our website. In some cases, typically where loan balances exceed $10M, the lender will require a separate, single-purpose entity (separate from the Investor entity) to serve as the borrower and title holding entity. In such cases, the title holding entity will be wholly owned by the Investor entity.